Valor Exterior Decorative Shutters are manufactured from a durable polypropylene compound with the colour moulded right into the plastic. Wood grain texture and beaded detailing give our shutters an elegant look, and are available in many styles to suit virtually any home. Although our shutters are custom made to size; because they are constructed using both extruded and moulded parts it's necessary to pay attention to the minimum and maximum lengths and width availability for each style. • Shutter lock fastener, which eliminates the need for anchors. 12 - 2-1/2” zinc screws with colour matched plastic caps are included with installation instructions. If installing into masonry, #8 nylon anchors will be required (not included). 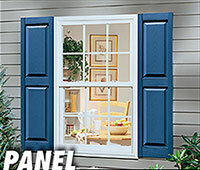 Shutter Lock Plastic Fasteners can be purchased as an option if desired, which eliminate the need for anchors. A “PAINTABLE” VERSION IS AVAILABLE, it is a different type of plastic and MUST be specified when ordering. Please indicate “PAINTABLE” where a colour would normally be specified. We recommend a light exterior grade primer, and a quality exterior acrylic paint. 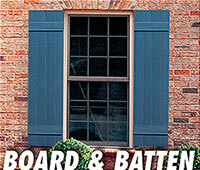 Our coloured shutters CAN NOT BE PAINTED. The durable material does not allow paint to adhere. 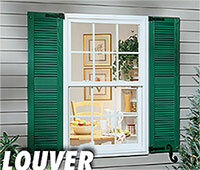 VALOR Custom Shutters come with a 40 year limited warranty, that covers excessive fading, cracking, and peeling, etc. The warranty covers only the cost of the product. Please review for available styles, and size availability. Although our 16 colours, as well as a paintable version (colours can not be painted), they really need to be seen by visiting one of our U.S. or Canadian dealers or retailers.